It has become very easy to download and share music with friends. As an audio forensic expert, I am often asked why music loses quality when transferred from one person to another. In the following post I will share some explanations about generation loss, file format conversion and the relevance to audio forensics enhancement and authentication. Back when I used to make 8-track and cassette copies of my record albums to listen to in my car or share with friends, the 8-track and cassette copies were considered first generation copies and sounded pretty good. When a copy was made from the first generation copy to create a second generation copy, it did not sound as good. This is because of ‘generation loss’. Although this is true for analogue recordings, it also is true for digital recordings. Format conversion is a contributing factor to generation loss in 8-track to cassette analogue copies as well as CD to CD transferring. When a digital copy of a compact disc is created, the operator must pay careful attention to the copying process. 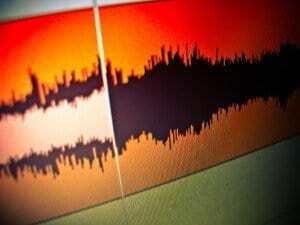 It is very easy to change the format of the digital audio file without knowledge which will cause generation loss. If the original CD which is a .WAV file is copied using any number of CD to CD copy software programs, it is very easy to change the format on the copy without noticing. Most people are pleased when they are successful that the copy plays rather than checking to make sure all the original characteristic in the original recordings are consistent in the copy. For example, when copying a CD it is very easy to convert a .WAV file to an MP3 without knowing. Since most CD players and computers today will accommodate both file formats (.WAV and MP3), the average person can easily overlook this format conversion losing quality and causing generation loss. MP3 is a lossy format which means that during the copying process some of the data is lost in an attempt to ‘compress’ the file making it smaller for internet use and storage reasons. This loss of data reduces the quality of the original audio recording. From a forensic perspective, when a file is converted from.WAV to MP3, the meta data is stripped and altered making it very difficult for the audio forensic expert to authenticate the recording for litigation. If you have an audio recording that requires expert authentication, make sure to send the original recording as it was presented to the expert and make and keep a copy for yourself. If you do not properly make the copy, worst case you will experience some generation loss and meta data alteration. The expert who is experienced in forensic investigation will have the best version of the recording to enhance and authenticate.